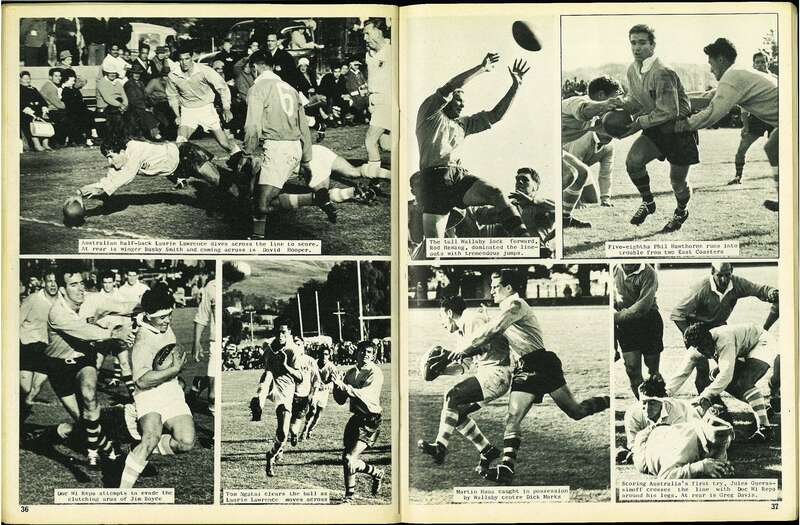 In a spirited display of international rugby, the touring Australian rugby team defeated East Coast by 28 points to three at Ruatoria's Whakarau Park last month. 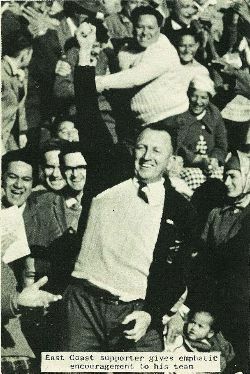 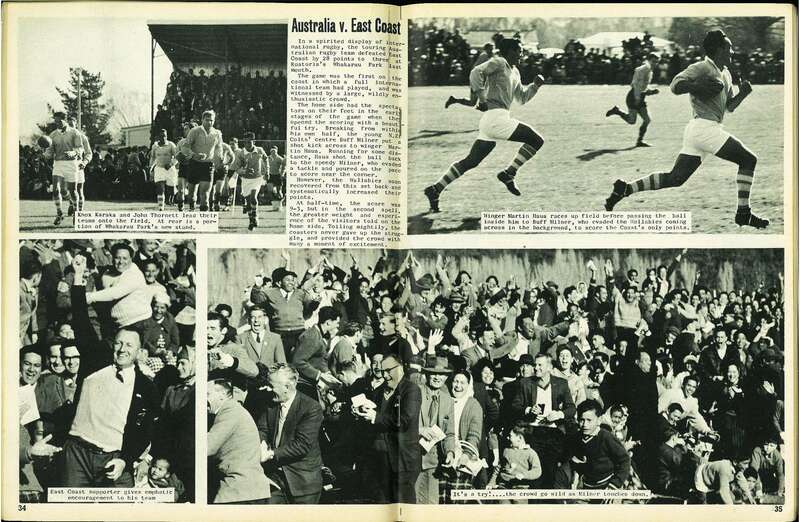 The game was the first on the coast in which a full international team had played, and was witnessed by a large, wildly enthusiastic crowd. The home side had the spectators on their feet in the early stages of the game when they opened the scoring with a beautiful try. 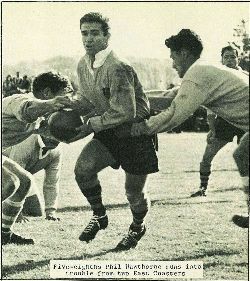 Breaking from within his own half, the young N.Z. 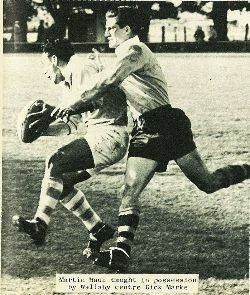 Colts' centre Buff Milner put a shot kick across to winger Martin Haua. 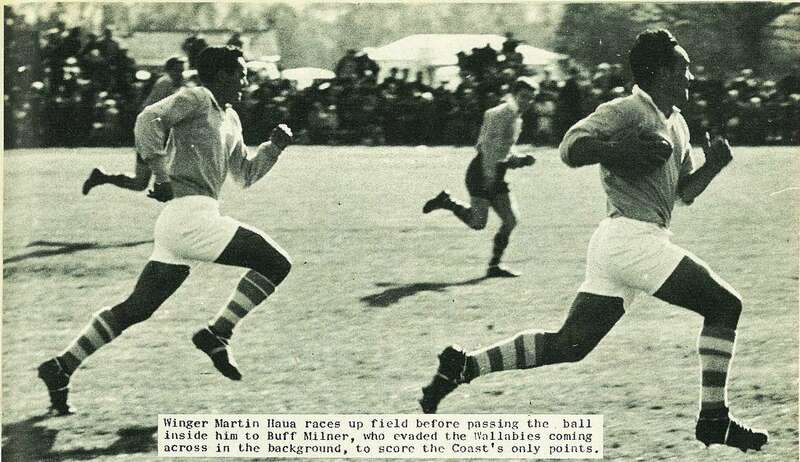 Running for some distance, Haua shot the ball back to the speedy Milner, who evaded a tackle and poured on the pace to score near the corner. 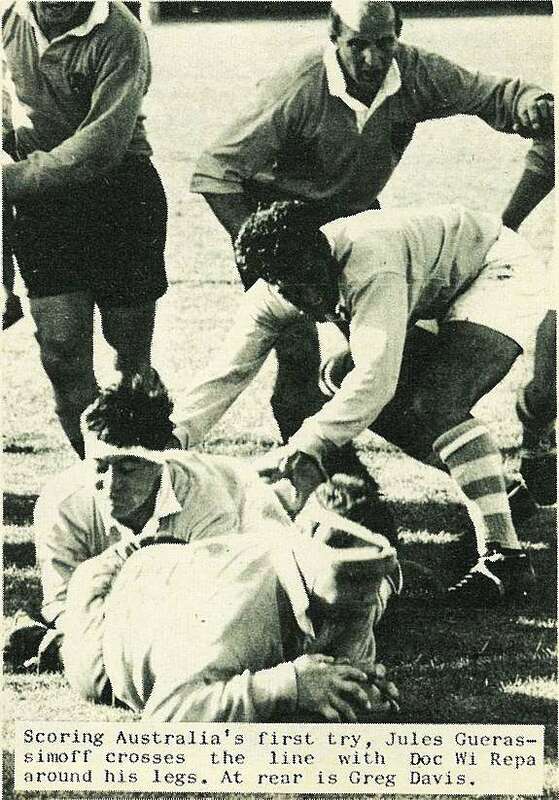 However, the Wallabies soon recovered from this set back and systematically increased their points. 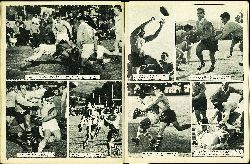 At half-time, the score was 9-3, but in the second spell, the greater weight and experience of the visitors told on the home side. 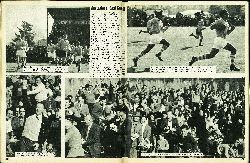 Toiling mightily, the coasters never gave up the struggle, and provided the crowd with many a moment of excitement. 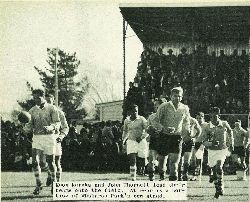 Knox Karaka and John Thornett lead their teams onto the field. At rear is a portion of Whakarau Park's new stand. 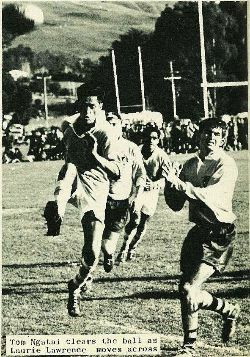 Winger Martin Haua races up field before passing the ball inside him to Buff Milner, who evaded the Wallabies coming across in the background, to score the Coast's only points. It's a try!....the crowd go wild as Milner touches down. 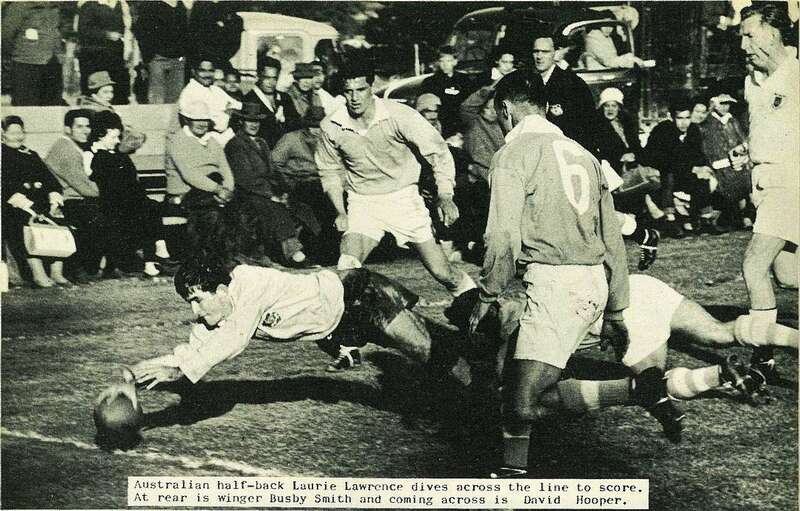 Australian half-back Laurie Lawrence dives across the line to score. At rear is winger Busby Smith and coming across is David Hooper. 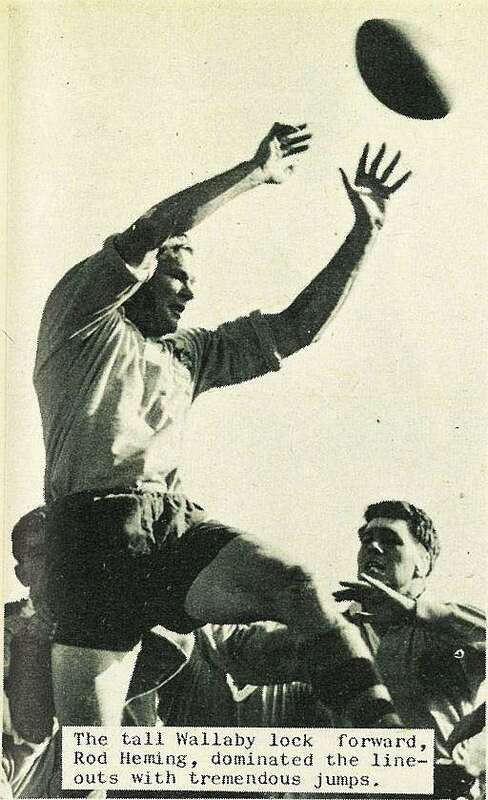 The tall Wallaby lock forward, Rod Heming, dominated the lineouts with tremendous jumps. 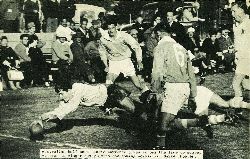 Scoring Australia's first try, Jules Gueras-simoff crosses the line with Doc Wi Repa around his legs. 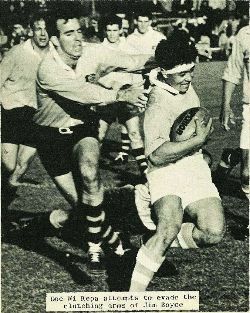 At rear is Greg Davis.